This texture will apply a metallic grill over your WindowBlind. A good portion of the underlying blind will show through the texture, so think of it as an "overlay" on top of the blind itself. Preview is shown use on the windowblind Lucite by Mrrste. Is this a texture ?? In so far as they are defined by Windowblinds, yes. That definition is actually very broad. The "texture" per Windowblinds is something like a layer on top of the blind itself graphically. This can be used in a whole bunch of different ways to change a blind. In this case, I chose to make much of the texture transparent, so the blind underneath shows through. In other cases, you can "cover up" all the things underneath, e.g. in your texture Satin. This is real nice, how can I get the wallpaper. Thank you! The wallpaper is Bi by Nucu (available through the link at DeviantArt.) 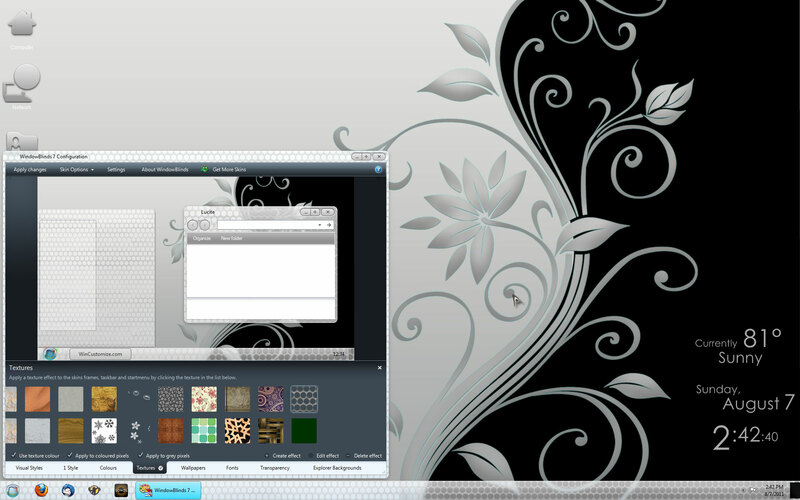 Yes, that is rainmeter, a skin called Elementary.